In the words of the immortal Sam Cooke: "Another Saturday night, and I ain't got nobody..." Close, but not quite. I had Happy Meal and a Groupon for ROFL Cafe on Melrose. We found metered parking on the street with no trouble at all. ROFL Cafe was the former home of 8 Oz. Burger Bar. 8 Oz. served up a really good burger (but over-priced), and my hopes were that ROFL would keep the dream alive. The chef of the now shuttered 8 Oz., Govind Armstrong, designed the menu for the new owners. After we placed our order at the counter, we waited for about 15 minutes for our burgers to arrive. Van Morrison's "Days Like This" was playing in the background, and that should have been our queue to walk. 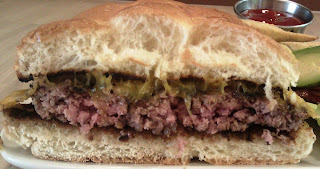 The Beef: The stingy, 1/3 pound patty was quite beefy in flavor. It was 100% Chuck, and it was peppered with connective tissue. I stopped caring after the first bite, and did not inquire for the source of the beef. It was moderately juicy with a fat content of about 20%. The grind was coarse, and the mouth feel was a little on the chewy side. The beef was average. The Seasoning: The kitchen at ROFL Cafe hit the burgers with nice dose of salt and pepper as they cooked on the grill. The Sear: What sear? The burger patty picked up some grill marks, but the heat had clearly been reserved for my bun, which was burned black. I sent it back and waited an unduly long time for a replacement. The Preparation: The burgers were cooked on a 20 degrees too cool gas-fired grill. The patties appeared to have arrived pre-formed. I deduced this from the low quality of the beef and the relative chewiness of the cheeseburger. 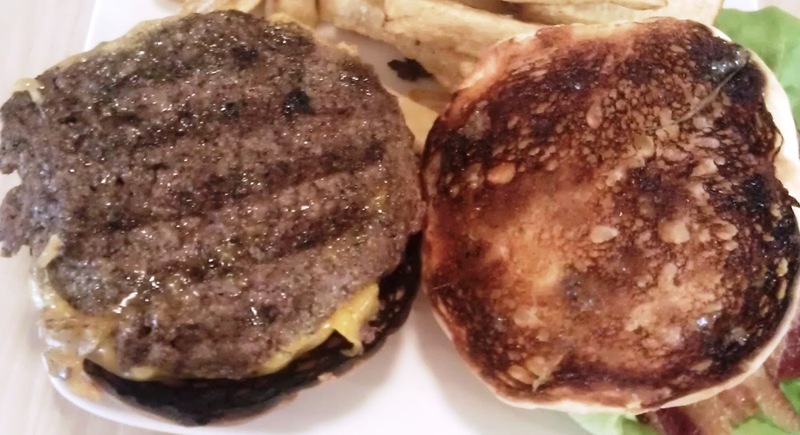 The bun was charred to the point of being too bitter to eat. The service was beyond poor. Even after I walked the burned bun up to the counter, no one came by to check on the food before or after the bun was replaced. A server inquired about our meal as he was clearing our plates, and I indicated that the burger was substandard. This was met with a dull stare and no verbal reply. The Cheese: The was a nicely melted slice of bland Cheddar. The Cheddar was as mute as the server and as satisfying as the total experience at ROFL Cafe. Consistency! The Bun: The first try was a burned, dry, chewy offense to buns everywhere. The second attempt was a toasted, moist, yeasty Kaiser roll. Oddly/insultingly, all of the photos of the cheeseburgers scattered throughout ROFL Cafe were of juicy burgers on Brioche buns. Bait and switch. It seemed that standards had been abandoned since the departure of chef Armstrong. The Meat To Bun Ratio: Way too much bun for a skimpy 1/3 pound patty. The Fries: The Kennebeck potatoes were cut in house and served peel-on. 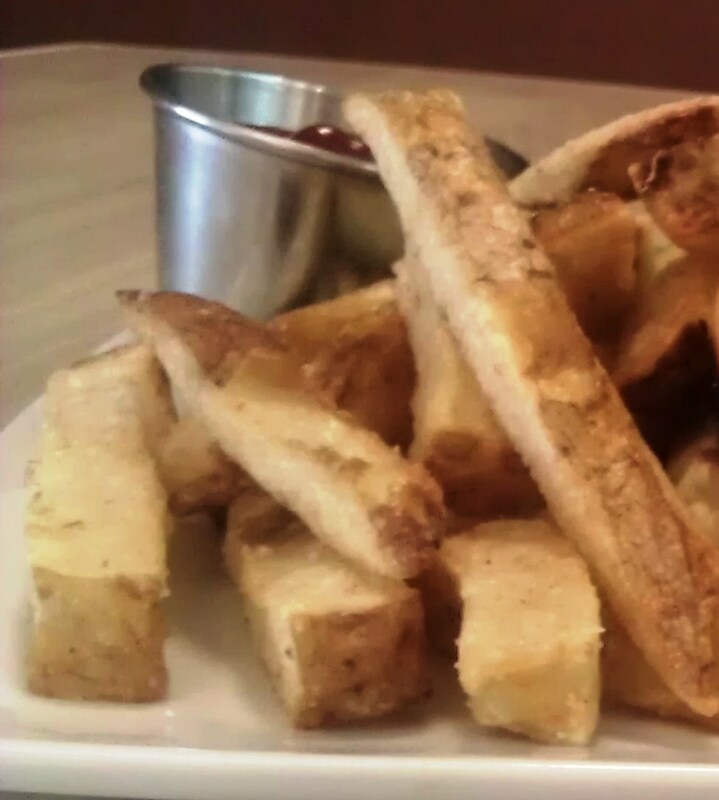 Sadly, the fries were over-cooked during the par-cooking process (Belgian-style). When the fries were cooked the second time, they interiors were rendered gummy, and the exteriors never properly crisped. The fries were properly seasoned, however. Consistency! The Toppings: The avocado was fine. The bacon was lank. The Bibb lettuce was leathery. The Ice Cream: Happy Meal felt the need for dessert, so I let him order the chocolate ice cream. The cashier did not mention that the ice cream was full of cinnamon and cayenne pepper flakes. The cinnamon was so heavy that the ice cream was gritty. It was also cloyingly sweet. Consistency! The Value: WEAK. Even with the Groupon, the cheeseburgers at ROFL Cafe were well over-priced. 11 bucks for a small burger, lank bacon, gummy fries, and a burned bun was on par with a groin punch. ROFL Cafe served up what seemed like intentional consistency in every aspect of the experience. Sadly, every aspect, from soup to nuts, was bad. Burger Review : ROFL = Rip Off, Fully Lousy. I will return when this establishment changes hands again.